After a week of climate negotiations in Bonn, Germany, negotiators saw general progress in spite of the impasse on one of the bodies, the Subsidiary Body for Implementation (SBI). The Russian Federation expressed its dissatisfaction with the manner in which decisions at Doha, Qatar, in November last year were gavelled into place without taking its concerns into account, and demanded exclusive discussions on procedural matters. This meeting in Bonn that began on June 3 resumes the second session of the Ad Hoc Working Group on the Durban Platform for Enhanced Action (ADP 2-2) which aims to achieve a universal climate agreement by 2015 to come into force from 2020, and to find ways to increase the current inadequate level of global ambition to address human-generated climate change before the end of the decade. The annual sessions of the Subsidiary Body for Scientific and Technological Advice (SBSTA) and the Subsidiary Body for Implementation (SBI) under the UN Framework Convention on Climate Change (UNFCCC) are being held simultaneously. These bodies will play an essential role in the effective implementation of the outcomes of the recent UN Climate Change Conferences in Cancún (in 2010), in Durban (in 2011) and in Doha last year. Russia’s concern regarding amendments to the second commitment period of the Kyoto Protocol were not addressed at the Conference of the Parties (COP) in Doha and the Doha Decisions were gavelled violating the consensus-bound process that the UNFCCC is required to follow. A negotiator claims that Russia has a political score to settle. Russia is demanding exclusive discussions on procedural matters it is unhappy about, a move India together with the negotiating bloc G77 and China – the developing country alliance –is opposing. Some fear such exclusive discussions could unravel the decisions taken at Doha. With only five more days of negotiations left, it is feared that a deadlock over SBI could result in the export of a large part of the body’s work on its to-be-agreed agenda to Warsaw, Poland, where the next COP will take place. This limits the level and scope of discussion that can be had since at a COP meeting they usually have more emphasis in more than just one area. The wrangling fortunately did not affect other areas of the conference. The other two bodies – ADP and SBSTA have started work. SBSTA, which focuses on technical matters, has been making headway on discussions such as Reducing emissions from deforestation and forest degradation (REDD) and the Nairobi work program. ADP is presently operating under two work streams – one on increasing ambition within the pre-2020 period and the other on scope and design of a post-2020 framework. At Bonn, there were discussions on whether to move to a more focused mode of working or ‘strict negotiating space’, or to continue with the open roundtable format for more free-flowing discussion, which has been the format that has been followed under ADP. 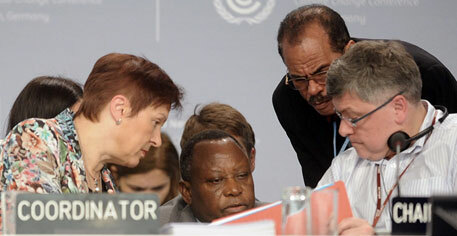 ADP will also be electing new co-chairs; the current co-chairs’ term ends by the end of the Bonn session. This is expected to change the dynamics within ADP. There have been glimpses however of where the potential for contention may lay. On June 8, at a round table under increasing pre-2020 ambition, a Chinese expert presented a paper that evaluated the gap in emissions required to stay within 2°C and what the country pledges actually amounted to so far under different scenarios. While there was uncertainty about how big this gap was, he said this gap was primarily due to lack of mitigation ambition from developed countries. The US disagreed with the methodology used for the study. According to the US negotiator, when cumulative emissions are considered about 2020, developing countries’ share would be larger than that of developed countries. China rebutted by saying this is unlikely to happen owing to the lesser-than-expected growth rates in emerging economies due to the current economic slump. The scale and magnitude of issues that need to be resolved for a global agreement in 2015 are large and this is undisputed. However, agreeing to a global climate formula will need parties to rise above national and domestic politics and the coming week and days will provide a testing ground for this.